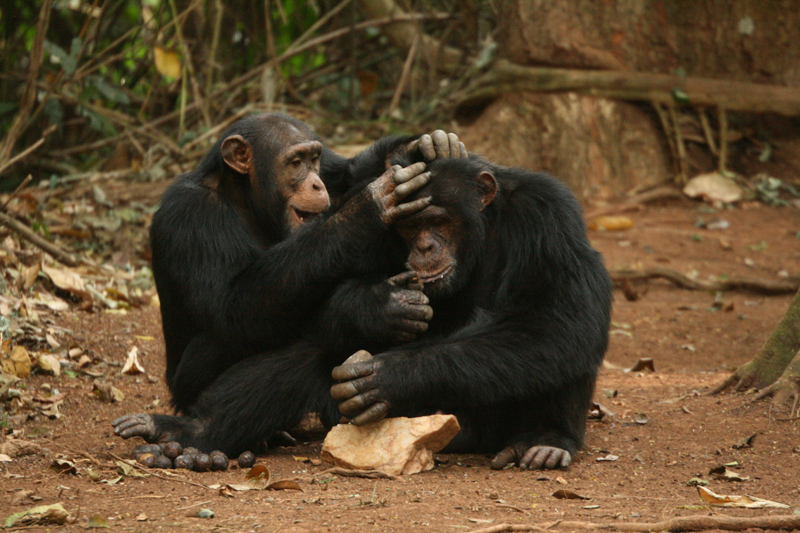 An adult male chimpanzee, Yolo, uses a pair of movable stone tools to crack nuts while being groomed by a juvenile male, Jeje. Bossou, Guinea, West Africa. Carvalho is part of the International Team for Bossou-Nimba Research, a long-term collaboration led by Kyoto University, Japan. Since 2006, her research has been focusing on wild chimpanzee stone tool use, in the forests of Bossou and Diecké. Recent funding bodies include MEXT grant #20002001 and #24000001, JSPS-U04-PWS to T. Matsuzawa, and National Geographic Society’s Global Exploration Fund, for the project: ‘Stones on the move: the real life of a chimpanzee tool’. The goal of this project is to test the hypothesis that the purported strategies of transport of resources by early hominins have been misconstrued and instead are similar to the transport of objects by chimpanzees. The model of planned, habitual transport of artifacts that positively correlates with distance of planned foraging range (Schick 1987, Toth and Schick 2006) may not reflect the reality of the Oldowan (2.6 -- 1.5 Ma). I hypothesize that, just as all the remaining differences between ape and hominin technology have been fading as research progressed during the last 20 years (see Wynn et al. 2011), the same will happen when we address the issue of transport with accurate methods. I hypothesize that transport distances in the Oldowan were the sum of many short bouts, which mislead archaeologists who take account only of the raw material sources and sites where tools were manufactured or discarded. Evolutionary, this is important, as transport remains one of the main differences claimed to produce cognitive enhancement in early human versus non-human primates. I have conceived a new method using micro-radio-telemetry: I will place small GPS tracking devices in chimpanzee stone tools and follow their movements in the forest over a year. This technology has never before been adapted and applied to inanimate objects. It should yield the first accurate data on distances moved, frequencies of transport, and use of the stone tools by wild chimpanzees. These GPS tracking devices, originally build for small birds, have been adapted to be able to function with stone tools. Firstly, I will carry out a pilot test, placing two devices in a pair of tools (hammer/anvil). This test will be performed in a so-called "outdoor laboratory", at Bossou forest, in a clear location, where researchers can conduct field experiments with nut cracking and easily follow the details of tool use (e.g. Carvalho et al. 2009). Here, I will test the equipment, and will fine-tune the devices to optimize the data collection of GPS points and battery lives. Then we will test the devices at natural nut-cracking sites in the Bossou forest. This technology will be complemented by the use of camera traps, placed in the selected sites. With this research we will able to understand the dynamics of transport, the on-site selection and use of tools, transport within, in and out of the nut-cracking sites. This pioneering study will be the first to shed new light concerning the real life of chimpanzee stone tools, leading us to propose a new evolutionary framework to contextualize the networks of transport during the earliest phase of the Oldowan, and more specifically, to explain early hominin sites where similar pounding activities may have occurred. We are currently at the testing phase at Bossou, from October to December 2018. This project is a collaboration with: Katarina Almeida-Warren, Tetsuro Matsuzawa and Ali Gaspard Soumah. Lab students involved in research: Katarina Almeida-Warren and Daniel Schofield. "Stones on the move"! A special collaboration with Katarina Almeida-Warren, pioneering micro-GPS animal tracking to record movements of chimpanzee stone tools over time. Step 1: drilling holes & attaching GPSs with epoxy. Step 2: the stones and nuts are in place and the outdoor lab is ready for business. Now it's just a waiting game. Step 3: first some poking, then some smelling, and... WE'RE ON THE MOVE! Step 4: Where they are now?